I spend so much time in my own head. All writers do, actually. It’s just how we function, how we dream up our worlds, how we play out the scenes that we intend to put on paper. We borrow from every single thing we hear and see to construct those, awake or asleep. It’s never been a weird thing for me to spend hours daydreaming. It’s been an unproductive thing, but never a loss. Inspiration comes from a variety of sources. In fact, it comes every source, conscious or not. Virtual worlds have been a foundation of inspiration to me for years. Not necessarily playing the game, but who I am when I play it. Not all players empathize and connect to the pre-crafted game character as they play the storyline. Most of us do connect to a degree, writers included, but every player brings a different plate to the table. Games get an undeserved bad rap, for reasons that apply to only a small segment of the player base, but some logical criticisms are broader and are valid to most. The one problem I have with my gaming hobby is the false sense of accomplishment it can bring. A hobby is a hobby and should be for pleasure. You don’t need to justify a hobby, but gaming tries to trick me into thinking I’ve actually gotten something done, and that’s a problem. Of course, playing something like Minecraft is different from games like Second Life—where you can actually sell your creations for Linden currency that can be converted to cash— but also different from games like Lord of the Rings Online or Warcraft, where all the content comes from the game servers and you’re never building a city or texturing a new outfit. My particular creative brain demands a real-world result to labor. That’s why I tend to gravitate toward games where my playtime can be extrapolated from the virtual to the real. Blender, Zbrush, and Photoshop are the tools I use to make my virtual creations in Second Life, but I don’t do much with them. I play with them, I take snapshots before they get packed into the inventory. That’s about it. What do I get out of that? Personal satisfaction maybe, and it has made me a fair hand with the software. My friends keep telling me to get on the SL Marketplace, get a business going. I try. I have a few things for sale there, compared to the thousands I’ve created. My SL avatar has been in-world for 7 years, so my inventory is massive. But unlike other games, items become obsolete in SL, the code evolves, creations become more sophisticated. The first chairs and clothing I made in SL seem incredibly clunky now. I couldn’t give them away. 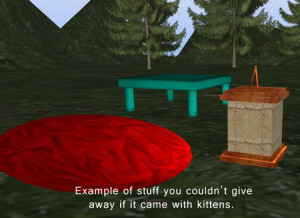 The most valuable things (to me) that I create in Second Life don’t stay in that world, not even a little. I have an office my avatar goes to in the morning, just like my real self moves to the laptop desk facing the big window. That’s where I sit down to write for the day, and sometimes when I need to feel like I’m somewhere else, my avatar goes wandering to forests, cities, ruined landscapes and alien vistas. Everything is inspiration, after all. I’ve always believed that the time I spend in my head isn’t a loss. When I type The End on a story or novel, I know that’s true. Postscript: Next week the header image above will have “My Life in My Head” under my name. It’s no secret (you can tell from the lapses between posts) that I’ve struggled for years about what to write about on my blog. Writing about writing isn’t for me, neither is review or critique, book recommendations or movies, but I can yap forever about living virtually on the Hypergrid.